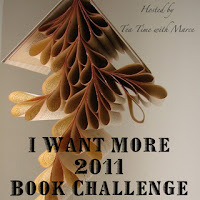 I discovered a few new-to-me authors in 2010 who I'd like to try again, so I'm going to join the I Want More Challenge hosted by Tea Time with Marce. I'm joining at the Give Me More level, which means I need to read 5 to 8 books written by authors that I have read before, and want to read again. I already have books on hand by Tatiana de Rosnay, William Martin and Ron Rash, three authors I've enjoyed, but only read once. Other authors I'm considering include Jeannette Walls, Lori Lansens, Alan Brennert, Paulo Coelho and Lisa Genova. I'll keep track of my progress here. Julie, thank you for joining the Challenge. I have Lisa Genova on my list for sure, I preordered her new one and I want to try LoriL and PauloC.